Maps can be an important highlight in many presentations. 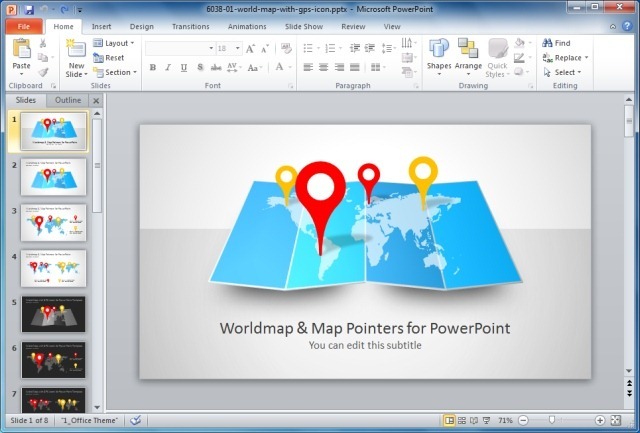 When touching upon topics related to history, geography, business outlets or the potential to expand to newer geographical locations, using maps in PowerPoint presentations can play an important role. Usually, presenters use static images to present maps which can make the presentation quite dull and confusing. 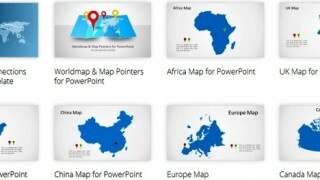 A better alternative is to use PowerPoint Map Templates. Slide Model provides many such templates for different continents, countries and the world map. Whether you need a map of Europe or a template with a comprehensive map of the United States or UK, you can use Slide Model Map Templates. These map templates come with a diverse range of layouts, with maps for a whole region/country and even specific areas. 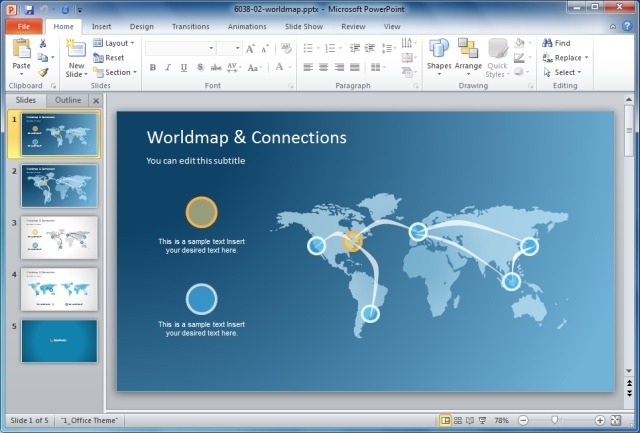 This is an amazing PowerPoint Template with a world map and pointers to help you show the different connections between different parts of the world. For example, you can use this template to display the different outlets of a business or to demonstrate the connectivity of an infrastructure (e.g. Telecom Infrastructure) across different regions. This World Map template is suitable for any kind of presentation which may require showing the World Map, be it for academic, business or personal use. If you are looking for a flat world map with large pointers in the form of clipart, then the World Map & Map Pointers PowerPoint Template is just what you need. Using this template you can mark different areas of the world map by moving around the given pointers. These pointers (GPS icons)are flexible enough to be moved, copied and deleted as per requirement. The template also provides different color layouts to help you craft visually appealing presentations that match with your content right down to the color tone. 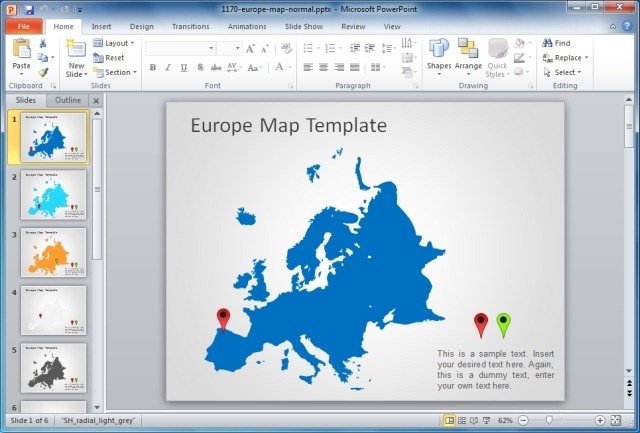 Among the different continental templates the Europe map PowerPoint Template provides a comprehensive map of Europe with GPS icons to be used as markers. 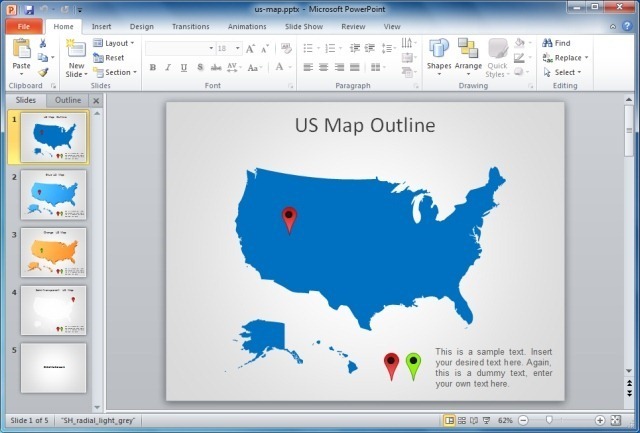 Among template for individual countries; the US Map PowerPoint Template delivers a complete map of the United States in different layouts with pointers to mark specific locations. You can download this template from the link given below and explore other such templates from our Map Templates Page. Tags: Business PowerPoint Templates, Diagram Templates, Funnel Analysis PowerPoint Template, Map Templates, Maps, Templates.